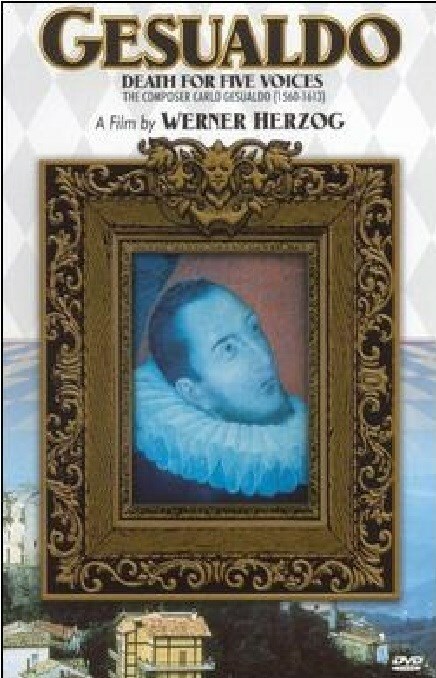 Line from this film: "He seemed persecuted by demons and furies"
Trivia: In later years, Herzog called this movie "one of the films closest to my heart"
An hour-long documentary produced for German TV, Werner Herzog’s Gesualdo: Death for Five Voices tells the amazing and sometimes frightening tale of Carlo Gesualdo, a Prince as well as a novice composer whose music was well ahead of its time. Delving into Gesualdo’s fascinating life, during which he wrote madrigals, murdered his wife and her lover, went mad, and even caused the death of his infant son, Gesualdo: Death for Five Voices charmed me when I saw it back in 2003, and the thought that a complex, disturbed man like Carlo Gesualdo was also able to create such exquisite music fascinated me to no end. Well… hell. All at once, I felt like a fool. So what do we know about Carol Gesualdo? He was a Prince of Venosa (a town in Southern Italy), born in 1566 and died September of 1613. He was also a musician of sorts (though never professionally), a composer of madrigals (secular music performed mostly by voice, with little or no accompaniment) who was ahead of his time (it wasn’t until the 19th century that a style similar to Gesualdo’s became vogue). And, of course, he was a murderer, killing his wife Donna Maria and her lover Fabrizio Carafa, Duke of Andria, after catching them in bed together (October 16, 1590). Despite the gruesome nature of the killings (the two were stabbed repeatedly), Gesualdo was declared innocent of any wrongdoings (because of his rank, surely, but also because his victims were adulterers) and never served a day in prison for this crime. After living abroad for a year or so in Ferrara (where he met his second wife, Leonora D’este), Gesualdo returned home, composed more music, and lived out his remaining years in a deep depression, quite possibly brought on by the role he played in the death of his first wife. Don’t misunderstand me; I still adore Gesualdo: Death for Five Voices, which is an eerily gorgeous motion picture (the tours of the Prince’s now-dilapidated mansion, with its collapsed ceilings and rooms filled with blooming flora, are among the film’s most poignant images). But, looking at it now, knowing what I know, I can more easily identify the fabrications. Personally, I never bought into the sequence featuring the supposed crazy woman who, believing she’s the reincarnation of Donna Maria, visits the estate regularly to perform Gesualdo’s music (this woman, played by Milva, a professional singer, was simply too good an actress). This time through, though, I could tell the scene with the chef and his wife was 100% fake (given a copy of the menu from Gesualdo’s wedding feast to review, the chef marvels at the sheer number of courses, totaling in the hundreds, while his wife lingers in the background, repeating over and over that Gesualdo was “The Devil”). Yet another falsehood involves the supposed death of Gesualdo’s 2nd son, who he thought might be the product of his wife’s extramarital affair (hearing the story again, how the infant was hung from a balcony in a swing, then rocked back and forth for 3 days as a choir sang death dirges below, is so outlandish that I’m a bit embarrassed I once believed it). Naturally, the musical interludes that pop up throughout the film, performed live by two separate companies, are very real. What’s more, they’re also quite beautiful. In most of his movies, whether they’re fact or fiction, Herzog the storyteller and Herzog the documentarian usually cross paths, resulting in dramatic films that have a realistic vibe (Aguirre Wrath of God, Fitzcaraldo) and documentaries peppered with a touch of the fantastic (Grizzly Man, Lessons in Silence and Darkness). As it turns out, Gesualdo: Death for Five Voices falls somewhere in-between, relating portions of a true story with elaborations and exaggerations thrown in for effect. 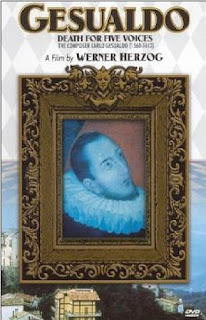 And like all of his best works, this 1995 “documentary” is a wonderful marriage of truth and lies, told as only Herzog could tell it.